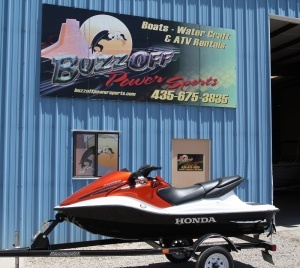 Buzz Off Power Sports rents boats, jet skis, and ATVs for enjoying Lake Powell. Located in Big Water, Utah, they provide ski boats, fishing boats, and Honda Aquatrax jet skis. Cruising across the lake in one of their Lake Powell Waverunners is an experience you don’t want to miss! 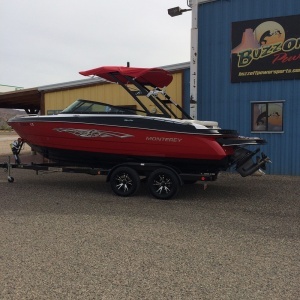 Buzz Off Power Sports has ski boats and runabouts; and feature Monterey and Lund brand boats. in front and rear, auxillary port, electric trolling motor, bimini, and lots of room. They also have a ski tow bar perfect for tubing! Get ready to Buzz Off across the waters of Lake Powell. Jet Ski rentals include the popular Honda Aqua Trax R-12, F-12, and F-12 Turbo. The weekly rate is based on a 7 day week. The Honda Aqua Trax has the best fuel economy of any PWC on the market. Check here for pricing. If it’s fishing Lake Powell that you’re interested in they have the boat for you! Check out our Lunds or Thunder Jet. They come equipped with trolling motors, livewells, fish finders. 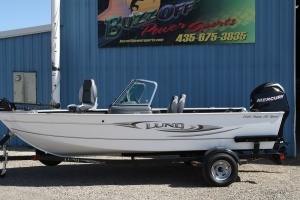 The perfect boat for catching your limit of fish on Lake Powell! Buzz Off has all the water toys you need to have fun with your Lake Powell boat rental: tubes, skis, knee boards and wake boards (all water toy rentals include a ski vest, rope and flag). or request a reservations online.